Then again, there's probably more publicity to be had, overall, with this extended drama rather than setting the record and being feted in the news for a few cycles. Someone on Facebook mentioned she ran 53 marathons in 52 days. Apparently nowadays a training run counts as a marathon. Not one official race that I can see. It's interesting that theses runners don't like competing but do like bragging about their achievements. This woman may be the LaVar Ball of running. This is fake because at the pace she runs marathons at she would have to be running on the treadmill for over 12 hours a day which is impossible for 7 days because she would have to get a substantial amount of sleep and have time to eat a substantial amount of food to make up for the running. I could see a sub 3 hour marathoner pulling this off but not a 3:35 marathoner. At the end of her video she says that she might attempt a trans-America run in the near future. I hope ya'll are ready for some old-fashioned sleuthing! What is with this epidemic of limey liarjoggers? I'm sure she'll claim some creeps are stocking her to bring validity to her "Robert Young-big" her way across the country. Because it brings them attention? She's got a ton of "glamor shots" and is mildly attractive, so of course it'll get good press and she'll raise tons of money and when she's found out as a fraud, it was "all for the greater good." I'm old and jaded so I assume if you're "running for charity", you're a narcissist and/or a cheater. Sounds like they didn't video the whole thing, recording "key milestones" is meaningless. 1000s of witness's at a gym is also meaningless if they are coming and going, an hourly log would take me only a few minutes to draft up in excel, again meaningless. A boyfriend witness, who has financial interest in her running through a charity, would appear worse than meaningless, it would be suspicious. Guinness is being smart this time, keep on it lets run slueths. I definitely have more respect for Guinness now. They probably are are tired of these grifters as we are. Total fraud. I tracked her on a daily basis via her GPS........the darn thing NEVER moved. Also, she sure spent a lot of time resting in a big RV with a guy named Kyle. Who is Kyle, and does her boyfriend know about him? Yes, and I boxed 15 round fights for 15 days in a row and Guinness didn't recognize it because my trainer was my witness. Please! The gimmicks are getting old. I laughed hard when I read that. This woman is an extremely talented multi day runner yet she chooses a career as a stunt runner for charity. What's wrong with that? She has got incredible endurance and exceptional physical recovery to allow her to run for twenty hours a day, on seven consecutive days. Yet she has never entered an ultra race and runs London marathon in around 4 hours. What's wrong with that? I'm thinking of making a comeback. Official Guinness World Record* set at The Trafford Centre, Manchester. Kudos to Guinness for insisting someone have better verification than their boyfriend. OK, you are an ignorant but couldn't you get someone to proofread the crap you write? There is a thread on the Ultrarunning Community Facebook page where Amy Hughes, her boyfriend Dave Keighley, and a couple of their shills posting. Gary Kiernan is once again defending the cheats and talking down anyone who doesn't for that line, threatening to "admin". Isn't Gary tired of being wrong every single time? If that thread keeps up, I might just have to put the Dave Reading investigation on pause to take a closer look into this one. Amy Hughes and her boyfriend Dave Keighley are spreading a lot of fake information on the URC thread and Gary Kiernan is defending the cheaters. 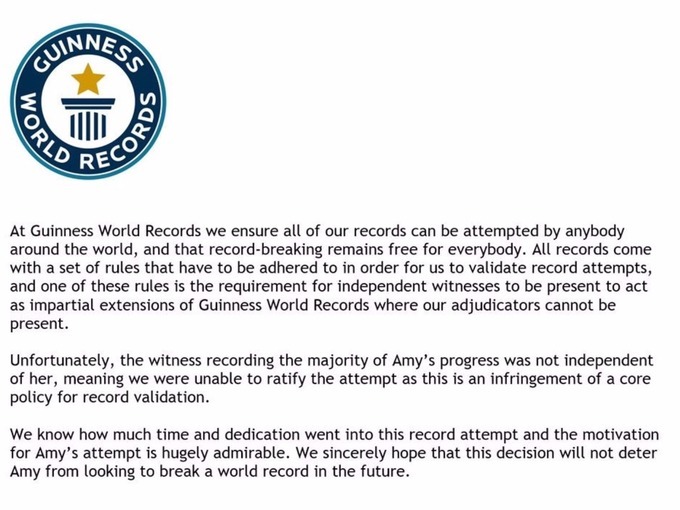 Guiness has publicly stated that Amy's boyfriend recorded the miles and that is why they are rejecting, not because of other reasons. I also took a look at Dave Keighley's Facebook profile. He lists himself as "self-employed". Gee, does that mean he is jobless or does that mean he is saying he works full time at the 53 Foundation he and Amy created and for which they have full control over the spending of donations? Like say the donations from this highly suspicious stunt run. So there are no many holes to their story and so many obvious motives that I'm starting to collect evidence on them. The official Guiness rejecting showing Amy Hughes' boyfriend recorded the majority of the miles.